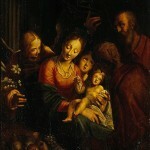 Hans von Aachen was born in Cologne in 1552. 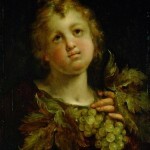 Variations of his name have included: Johann von Aachen, Janachen, Fanachen and a number of other variations. This self-portrait was painted in 1574. The Flemish master E. Jerrigh is believed to be the young German painter's first tutor. Like so many artists of his time, he traveled to Italy to further his craft. 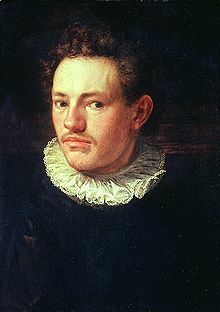 Aachen's home was in Venice but between 1574 and 1588 he spent much of his time in Florence and Rome. He briefly studied under Kaspar Rems but opted to develop his own mannerist technique. He studied Tintoretto (1518-1594) and Michelangelo's (1475-1564) followers but was most influenced by the style of Bartholomeus Spranger (1564-1611) and Hendrick Goltzius (1558-1617). Hans von Aachen painted for the Court of the Duke of Bavaria in Munich while in Italy. The source did not mention a date. One would assume though, that it was during the time Aachen is known to have been in Italy, perhaps between 1574 and 1588. In 1588, Aachen returned to Germany. While he earned acclaim for historical and religious scenes, the German painter became most well-known for his portraits. 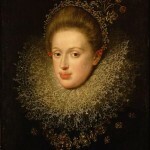 He painted portraits for a number of noble houses and it was most likely through these connections that he would meet his wife Regina, daughter of the composer Orlando di Lasso in Munich. He was introduced to the Imperial Court in Prague and in 1592 was appointed the official painter of Rudolph II, Holy Roman Emperor. 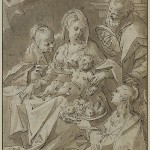 Hans von Aachen painted portraits and copied pictures the emperor liked. He also purchased paintings for the imperial collection. While one source stated he bought paintings for Rudolph, other accounts would indicated that Aachen, in the role of ambassador, coerced some art patrons that “gifts” be made of paintings the emperor desired. Around the turn of the Century, Aachen moved to Prague where he was commissioned to paint mythological and allegorical subjects such as the Liberation of Hungary. Hans Vredeman (1527-1607) and Aachen collaborated in 1598 on the altar of Hradcany Castle's All Saints' Chapel – a work featuring Mary and Gabriel. The painter was knighted by Emperor Rudolph in 1605 and continued working under his successor Matthias I.
Hans von Aachen died in Prague in 1615. 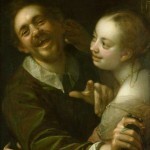 Hans von Aachen painted in the style of Low German Mannerism. He worked in Italy, at the Court of the Duke of Bavaria in Munich and at the Court of Rudolph II in Prague. He is somewhat well-known for his light-hearted approach with nudes. In keeping with our family-friendly goals, we will not be including examples of them but feel the artist left of plenty of other wonderful paintings for everyone to enjoy. Students included Pieter Isaacsz (1568/69 – 1625) and Joseph Heinz (1564-1609).